This week’s images are from a recent trip to central Florida where I had the privilege to watch a Florida Falconer fly his beautiful Peregrin falcon. Being an avid falconer for over 40 years myself, it brought back a rush of memories as I watched in awe of this beautiful bird in flight. One of the things that was amazing to see was the use of a drone to lure the falcon up into the sky. 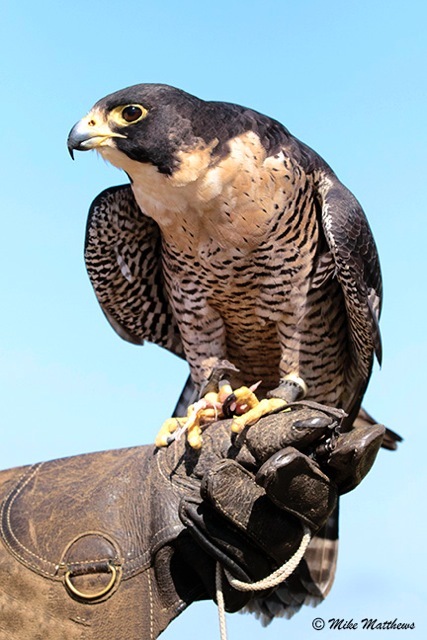 Once the falcon reached a certain height, she then hit the lure that otherwise would have been swung by the falconer. Upon impact of the lure, it broke away easily and had a parachute attached to create drag so the falcon could not fly off with it. From there they both gently floated to the ground and the falcon enjoyed a quail wing that was attached to the lure as part of her reward. Falconry has come a long way! For those of you that are interested, I will be adding a Bird of prey workshop starting January 2016 and running through the middle of April. There will be lots of opportunities to photograph raptors in flight, along with a lot of other birds such as eagles, owls, hawks, and even Crested Caracaras perched in natural settings.